Whether you've been knocking on doors for Barack Obama, making phone calls for John McCain, or trying to decide who will get your vote, it all comes down to tomorrow's results. Not surprisingly, quite a few Washington dining and drinking establishments have put together special menus and events to encourage you to join them tomorrow night as the returns come rolling in. For true party die-hards, of course, the places to be are the Capitol Hill Club (for Republicans) and the National Democratic Club (for Democrats, obviously) on the Hill. Both will be offering food and drink specials for their members and you can bet the crowds will be glued to the exit polls all night long. But for those who would rather watch the election results while wining and dining, there are plenty of options. 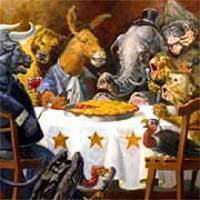 Charlie Palmer Steak - Why not watch the returns in a spot where dozens of Congressional fundraisers take place every month? Charlie Palmer, with its updated take on a classic steakhouse menu and its proximity to the Capitol, is a favorite spot for power lunches and fundraising events. On election night, they will be offering complimentary passed canapes from 5 to 7 and select beverages for $'08. Once polls start closing at 7, you can opt to stay and order from their regular menu. Art and Soul's Art Bar - Located in the Liaison Hotel on Capitol Hill (415 New Jersey Ave., NW), newcomer Art Bar is avoiding any partisan overtones while reaching out to voters of all stripes. A purchase of any two signature cocktails between 5 and 10 PM earns you a free appetizer from a generous list of options. Don't forget to flash your "I Voted" sticker! Chef Geoff's, CG Downtown and Lia's - All three of Geoff Tracy's establishments will offer election-themed Happy Hour specials at the bar all night long. Throughout the restaurants, $5 Ciroc O'Pamas and McCane Mojitos should help get the crowd fired up, and you can be sure the TVs will be tuned to MSNBC as Tracy's wife is Chief Washington Correspondent Norah O'Donnell. Chef Geoff's Downtown should be packed with folks who will be coming directly from work in the neighborhood, so this is likely to be a hot spot. Busboys and Poets - If you're rooting for Obama, you'll be in good company at the original Busboys (14th and V Streets, NW). They promise to "stay open until Barack Obama is declared the winner!" Their website indicates food and beverage specials, but there are no details yet. The usual laid-back vibe is likely to be replaced by an electoral electricity - and you'll be within walking distance of Ben's Chili Bowl if the race drags on into the wee hours! 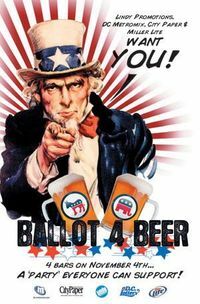 Ballot 4 Beer (Tortilla Coast, Bullfeathers, Thai Roma and Tune Inn) - If you'd rather spend Election Night on a Capitol Hill bar crawl, Lindy Promotions has just the thing. Their Ballot 4 Beer bar crawl provides a chance to partake of Republican Red and Democrat Blue shooters, $2 Miller Lights and fun and games all night long. This may not appeal to most DC Foodies, but it's worth noting for the creative approach to the night. Arlington Cinema N' Drafthouse - From 7 to midnight, everyone's favorite place to enjoy a frosty adult beverage while watching recently-released movies will feature free admission and CNN coverage on the Big Screen. Comedy Central's Indecision 2008 coverage will be broadcast in the Lounge starting at 10 PM. If you're a BIG election fan, this is likely to be the biggest screen in the area to watch on. Johnny's Half Shell - You can be sure that Johnny's will be showing election coverage all night long as this is another favorite haunt for Hill employees after a long day of constituent service. Located within walking distance of the Senate Office Buildings, Johnny's is offering a free "Southern Strategy" (a variation on a margarita with bourbon and orange instead of tequila) to anyone who shows up with an "I voted" sticker. Brightest Young Things' Election Party 2008 at Bohemian Caverns - When an Election Night party starts at 3PM, there's a good chance it will get pretty crazy. This one will feature DJs, cocktail specials, a champagne toast if Obama wins, and inflatable boxing and/or a moon bounce. The entry fee is $5, which works out to less than $0.50 an hour if you stick around until the bitter end. Not for the faint of heart. For an old-school political experience, you could also head to Shelley's Back Room and watch the results through the dim haze of cigar smoke. No matter where you go for dinner tomorrow night, you can bet you'll be able to get regular updates on the state of the election - whether from big screen TVs in the restaurant, from your waiter or from the guy at the table next to you who just won't put down the BlackBerry.